Is Serbia ready to go a step further in developing the biogas sector? Belgrade March 1, 2017 – By adopting new incentive measures for the production of electrical energy from renewable sources in June 2016, a good framework for fast development of new biogas plants in Serbia was created. These measures will be in force until the end of 2018, and in the meantime, future ones should be considered – it was concluded today at the conference dedicated to sustainable growth of the biogas sector in Serbia. 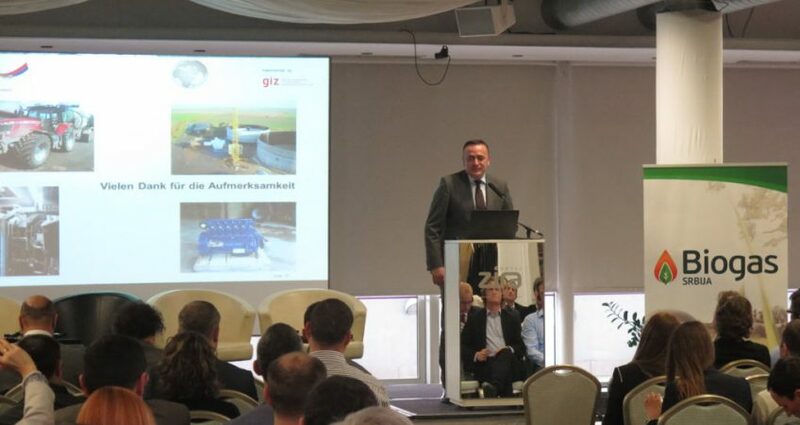 The expert conference which was organized by the Serbian Biogas Association, the Ministry of Mining and Energy of the Republic of Serbia and the program of Serbian-German developmental cooperation implemented by GIZ “Development of a sustainable bio-energy market in Serbia” that gathered the representatives of biogas associations from Serbia and Germany, but also other renowned experts in this area. The goal of the meeting was to exchange experiences, expand cooperation and talks about possibilities for developing the concept of using thermal energy, gas purification systems and their use, as well as the possibilities of use of digestate. Minister of Mining and Energy, Aleksandar Antić, highlighted that the topic of renewable energy sources was of great importance for Serbia. “We invested great effort and energy into promoting this topic and highlighting that the use of renewable energy sources is a serious opportunity not just for the energy system of Serbia, but also for the agriculture and the green economy of the country,” the Minister underscored, adding that he personally deeply believed in the future of biomass and biogas in Serbia.